Opened in September 2012, Hurstwood View is a care home in Uckfield that provides 24 hour general nursing and residential care, as well as expert care for those living with dementia in our Memory Lane community. We also offer respite care for those who are looking for something more short-term. Situated in the glorious East Sussex countryside and a stone’s throw from the renowned Ashdown Forest, Hurstwood View, known locally as the 'Care Hotel', is a popular destination for people with a variety of care needs. Ash Down Walk, our Nursing Floor, has been designed to a high specification and offers exclusive single room en-suite accommodation. Each room is tastefully decorated with coordinating soft furnishings, a nurse call point, TV point and Telephone point are in situe. Wifi is available throughout the building. As well as 26 sizeable single on-suites the Ground floor comprises of two spacious lounges with patio doors leading out to the extensive gardens and outside seating areas. Also on the nursing floor a dining room with views over the East Sussex countryside. There are additional bathrooms and rest room facilities throughout the nursing floor area. Our Clinical Team is committed to providing professional and respectful care and maintaining Barchester’s exceptional standards. Our Memory Lane Community is a dedicated part of our home which provides supportive and enabling care for people living with Dementia and other related challenges to memory. Here you will find the highest standards in care and support for people living with dementia and their families and friends. Our daily activities programme managed by two dedicated Activities Coordinators enables our memory lane residents to maintain their self-esteem, encourage independence and promote freedom of choice. Memory Lane in designed and managed to allow our residents to thrive by stimulation and to an enriching life and giving their families peace of mind that their loved ones are in a safe and loving environment. We have a number of Assisted Living apartments available here at Hurstwood View. Please click here for more information. At Hurstwood View we work in conjunction with Local GPs, health and Social Services to ensure the best possible package of care and support is available to every resident. As well as supporting your care needs we like to deliver a variety of services to make your stay with us an enjoyable experience other services would include our hair and beauty salon, chiropody, a daily newspaper, weekly trips out to various places of interest in our own minibus, and regular visits from people from different faith groups. If you are heading north on the A26 to Crowborough take the second right onto Ashengate Way and then the first left onto Linum Lane. We are located at the end of the road. Staff at Hurstwood View are celebrating after our home performed strongly in Your Care Rating 2017/18, a nationwide survey of care home residents, families and friends. The results show we were given an overall score of 864 out of 1,000 by family and friends. You can read the report here. 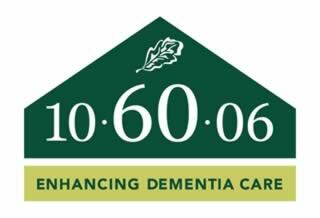 We are proud to be one of the first nursing homes to be accredited as part of Barchester’s 10-60-06 Dementia Care programme, reflecting the enhanced quality of dementia care and improved quality of life experienced by residents here at Hurstwood View. Here at Hurstwood, we value our friends and relatives as much as the residents. These very important people are vital to helping us provide the best person centred care we can. Some residents with memory loss cannot tell us their preferences and wishes very easily, so we are always grateful to the family and friends of Hurstwood who can help us to build life stories of the individuals we care for. This information assists us to go that extra mile and give residents and their loved ones the highly professional and sought after care they deserve. We have an excellent catering team who will cook home cooked meals every day and cater for all dietary requirements; nothing is ever too much bother for our friendly team. Our activities team provide daily entertainment, from having a knit and natter afternoon, to bringing choirs and magicians in for live entertainment! We are a strong, focused group of caring individuals and together we make Hurstwood a continuing success. We can't wait for you to be part of this. Hi, my name is Kirsty and I am the General Manager here at Hurstwood View. Welcome to our website! I began my career in the care industry in 1997, working in a small private care home for 17 years, which I enjoyed every day. I provided individualised care, support, social interaction, comfort & compassion to residents. In 2003, I decided to study Nursing at Brighton University, as it had been my ambition since an early age. I continued to work at the care home during evenings & weekends, throughout my training, and received my nursing qualification in 2006. Becoming a nurse gave me such fulfillment, along with a great responsibility, which made me extremely proud about what I do. I joined Hurstwood View in 2012 – and that is where my journey at Barchester began. I love to spend time with my family & friends and I also enjoy travelling. I played football for 15 years in a woman’s team, but I’ve hung the boots up now! Hi, my name is Sam, and I am the Deputy Manager here at Hurstwood View. Ever since I was a little girl, I have always wanted to care for people and dreamed about being a nurse for many years. I began studying Nursing at Swansea University in 2006, straight from school and, when I qualified in 2009, my first position was working on an ICU. I worked there for over six years and this helped me to develop my clinical skills. I learnt how to give individualised care and support to patients and families. I always feel a great sense of achievement working as a nurse, knowing I can make a difference in people’s lives. I have been at Hurstwood View since May 2017, starting out as a nurse before making the jump to Deputy Manager 6 months later. I love the interactions with all the residents and enjoy singing and dancing with them! I enjoy doing group crosswords too, and we now have a big team of crossword experts. I have been working in the care sector since 2005. I started off as a care assistant and have worked for many different homes, including a hospital specialising in orthopaedic surgery. During my career, I have gained my NVQ 2 and 3 in Health and Social Care, but my passion throughout my career has always been for looking after individuals who are living with dementia. I am really enjoying my role on Memory Lane, working alongside a fantastic team and very supportive management. It really is a privilege to be part of the Memory Lane community and to share the journeys with each individual. Hi, my name is Cathryn, and I joined the team at Hurstwood View in August 2017 as the Administrator. I have worked in care home administration since 2002 and have since gained an NVQ Level 3 in Business Administration. My role includes managing the financial systems in the home, HR, enquiry management and working closely with the General Manager. My favourite part of the role is interacting with residents and their families. I joined the team at Hurstwood View in June 2015 as an Activities Coordinator. I began working within the care industry 12 years ago, beginning as a support worker and outreach coordinator at Headway in Newick. This position paved the way to me attending the University of Northampton to work towards various qualifications within the Acquired Brain Injury field, which I am incredibly proud of. Most recently, before joining Hurstwood View, I worked with the South East Coast Ambulance service as a full time Emergency Medical Advisor. I was the first point of contact for 999 calls to the ambulance service. This job was incredibly rewarding and fast moving, as you would imagine! In the November of 2013, however, my partner and I had the biggest surprise when we found out that I was pregnant with our first baby, Pippa, who is now fast-approaching the terrible twos. This lead me to find a role which was a little less stressful and allowed me more time to spend with our little girl, and this is how I came to work at Hurstwood View. I am loving my career as an Activities Coordinator as I really enjoy the arts and crafts, am a keen baker, and love finding interesting places to visit. I particularly enjoy when we have the Pet Pals in, as the residents absolutely love seeing and interacting with the animals, as do I! In the past year we’ve also had many brilliant musicians in, which often leads to a little sing along and a boogie. One of my favourite trips we have been on is to our cherry tree in Northiam where, once a year, we get to go and pick cherries from our own tree, and get to enjoy a picnic in the great outdoors. We also bring plenty home for residents to share with friends! If you want to see more of the sorts of activities we get up to at Hurstwood View then pop by the Life at Our Home section on the website. I have been working in the healthcare Industry for the past 8 years and joined Barchester in 2012 when Hurstwood View opened. I am employed as an administration assistant. My job includes answering the telephone and keeping up with invoicing as well as other daily administrative roles. The best part of my role is welcoming residents and their family and friends to our lovely home. Each guest receives a smile and offered refreshments. Hurstwood View is truly a wonderful place to work every day is different and we are a real and growing community. In my leisure time I spend as much time as I can with my 3 grandchildren who are a delight. I also enjoy reading and am currently working my way through Divided Loyalties by Patricia Scanlon. I also enjoy Jigsaws, crosswords and especially scrabble (although, the latter I am not very good at). My name is Sam and I am an Activities Coordinator here at Hurstwood View, and I joined the team in later 2018. The home has such a friendly & welcoming atmosphere; it feels like one big family. I take great satisfaction in contributing and making the residents' days happy and fulfilled. I like to organise activities that are both engaging and meaningful, and I look forward to coming back to work each day to see everyone again. Hi, my name is Christine and I have worked at Hurstwood View since November 2012 as an Admin Assistant. I have a background in administration and finance. I love to travel and enjoy watching musicals and most sports, especially tennis, swimming and football. I enjoy working at Hurstwood View, as no two days are the same. I enjoy meeting and greeting people and building a rapport with residents and their loved ones. Hurstwood View is a friendly and happy place to work in. In September 2011, my partner & I arrived back in the UK after 21 years of living in Australia to be with our ageing family. I had no idea what kind of job I wanted to do but I didn't want to go back to Driving Instructing or the IT industry so the ad for an admin assistant at Hurstwood View jumped out at me & I haven't looked back since I joined in June 2012. I love the interaction with the residents & families, also the fact that everyday at Hurstwood View is never the same as the day before! I have been working in the catering industry for over 15 years and worked in a number of different kitchen environments. I simply adore cooking and love to experiment with various flavours. Being Scottish I am very fond of traditional Scottish dishes which when I am cooking, love to add a different twist. I am very fortunate to live in East Sussex with my husband and daughter. Sussex is a beautiful county with many interesting and historical places to visit. I love my job at Hurstwood View and in particular itâ€™s a privilege to meet and work with so many interesting residents. But what I love most is when people tell me they enjoy my food! My name is Wayne Grogan and I have worked in the hospitality sector for over 12 years. I started of running my own business in dealing with phones, this was for 4 years before I decided that I wanted to move into another career. I worked in the hospitality field for 12 years at Heaver Hotel, the job involve ensuring that the conferencing facility and 90 bed hotel was run appropriately. I gained experience in customer care, health & safety and the well-being of the guests. I was facing the possibility of redundancy and when researching for a job, I saw the position at Barchester Hurstwood View and thought that I would take a chance and the opportunity and benefits that Barchester were offering gave me the push to apply. As I want to progress into higher management with Barchester and this sounded like the company that I could grow within. The chance to have contact with the residents and the interaction is so great, when working at Hurstwood, no day is the same. It is also good to have resident’s ask me to deal with an issue within their room and have a little chat with them at the same time. I am enjoying working part of such a diverse team and ensuring the presentation and safety of the home is paramount in my day to day responsibilities. During my time working at Heaver Hotel, I was voted Employee of Month, then Employee of the Site for the year and then got flown to Portugal and came 2nd in the finals of the Employee Recognition programme and was awarded £2,500.00. This money I then used to pay for my honeymoon to the Dominican Republic. I came into care when my children began school over 20 years ago. I have worked in a variety of services, including palliative care and adults with learning difficulties. Years ago, a friend recommended that I apply for work at a new Barchester home in Five Ash Down; I did and happily joined the team, and here I am now thoroughly enjoying my role caring for residents. I came to England in August 2016 from Romania, and was lucky enough to be offered the role of Care Assistant at Hurstwood View. I had heard lots of good things about the home, so I was pleased to be given this opportunity. I thoroughly enjoy caring for residents, hoping that I make their days bright and cheerful.